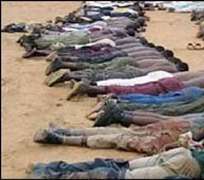 The corpses of civilians are scattered around the streets of Maiduguri, after being pulled from their cars and shot, eyewitnesses say. The police and army are patrolling, firing into the air, apparently trying to clear civilians from the area. There are unconfirmed reports of a jailbreak in the town. In Wudil, three people have been killed and more than 33 arrested. The senior police officer in Wudil has been wounded. Mr Yusuf's followers in Bauchi are known as Boko Haram, which means "Education is prohibited". They attacked a police station on Sunday after some of their leaders were arrested. Correspondents say the group is seen locally as a fringe group and has aroused suspicion for its recruitment of young men, and its belief that Western education, Western culture and science are sinful.